In a histogram to visualize a set of values, data can be considered "skewed" meaning it can have a long tail on a side. This article will cover common interpretations of skewness. This distribution has no skew because it's perfectly symmetrical. With this distribution of no skew, the mean and median are typically at the peak. Let's calculate those and visualize them. Looks like the median and mean values are the exact same and at the peak. 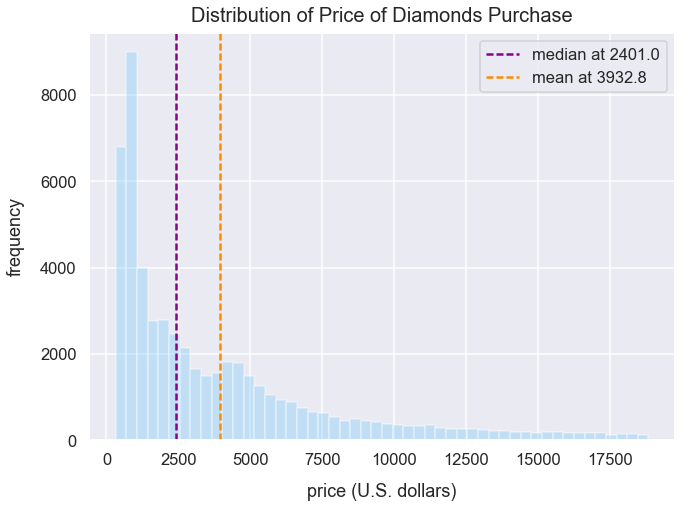 Each row of df_diamonds contains details about a specific diamond purchased. We'll just utilize the price column in our analysis below. 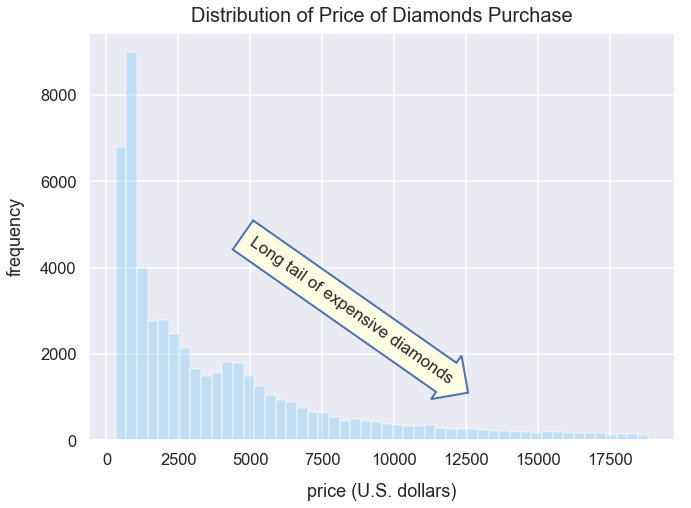 Below is a histogram of the price field in df_diamonds. Most people tend to buy diamonds that are just a few hundred or few thousand dollars. Yet, it seems a small group of people are willing to pay over 10,000. This distribution has positive skew because there's a long tail of values on the positive side of the peak. You would otherwise say this data is "skewed to the right". In distributions in which there's positive skew, it's important to understand where the mean and median lie. Let's plot this distribution again and mark the mean and median values. Calculate the median and mean value of horsepower_numerical_values using numpy methods. 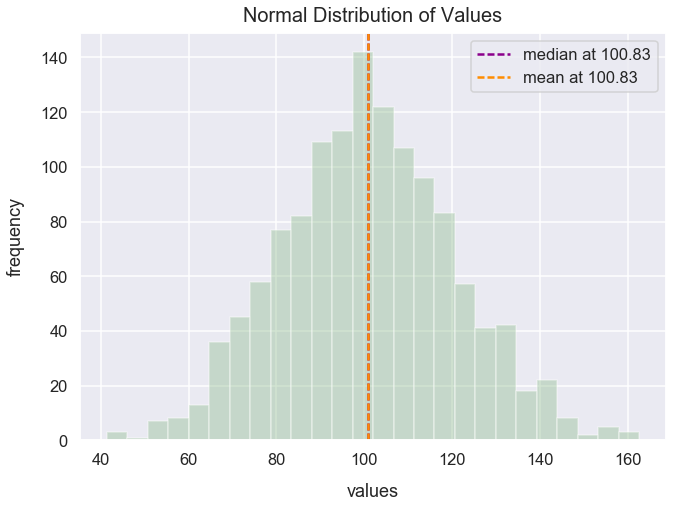 Nearly with all histograms that are positively skewed, the mean is greater than the median. 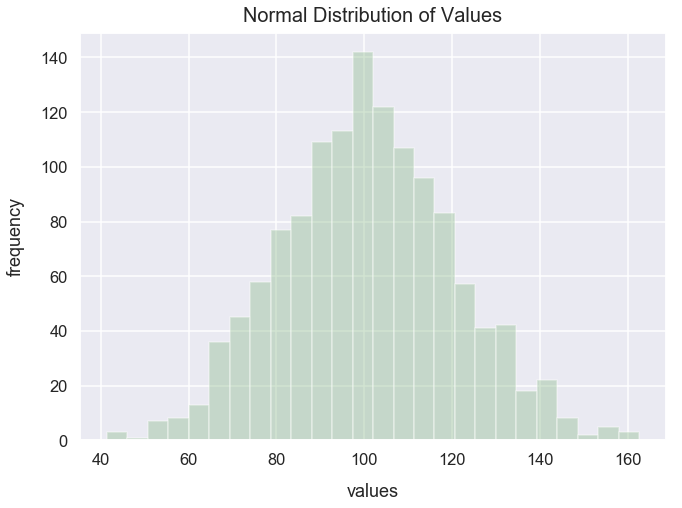 The reason for this is that the long tail of values skews the mean higher than with a more normal distribution. Yet, the median isn't skewed by large values because it's just the "middle" of a list of sorted numbers. Using the scipy package's stats module, we can call the beta() method to create a list of values with a negatively skewed distribtion. The data below ressembles the prices of meals for a fast casual restaurant. 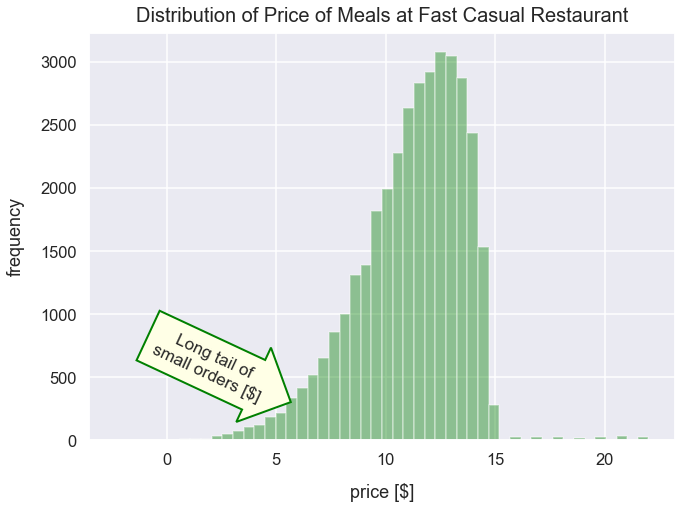 I use the randrage() method from Python's random module to generate a list of large meal orders between the prices of 15 and 25. I concatenate the typical_meal_value_dollars and large_meal_value_dollars to create a new list assigned to the variable meal_values_dollars. Most people tend to spend around 10 to 14 dollars on their order. Very few people spend greater than 15. Lots of people spend between 0 and 8 and likely buy small items like appetizers or just drinks. This distribution has negative skew because there's a long tail of values on the negative side of the peak. You would otherwise say this data is "skewed to the left". In distributions in which there's negative skew, it's important to understand where the mean and median lie. Let's plot this distribution again and mark the mean and median values. Calculate the median and mean value of meal_values_dollars using numpy methods. Nearly with all histograms that are negatively skewed, the mean is less than the median. The reason for this is that the long tail of values skews the mean lower than with a more normal distribution. Yet, the median isn't skewed by lots of small values because it's just the "middle" of a list of sorted numbers.